Data Analysis is the key to making business decisions about your process or product. To improve the process or product you have to measure it. Once you have the measurements, you need to quickly interpret the data. 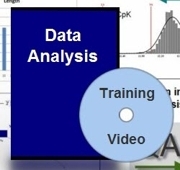 This data analysis video shows you how to present the data to management and others. Normally, management is not interested in the raw data. Business decisions are based on the summarized data or graphs of the data. With this DVD version, you will receive the DVD in the mail. In addition, you can instantly download the training after the purchase. Your Satisfaction is Guaranteed. Within 30 days, if you are not satisfied with this product, I will refund your money. In addition, you will learn how to use Microsoft Excel to conduct the data analysis. A final spreadsheet is provided for your review. Your Satisfaction is Guaranteed. Within 30 days, if you are not satisfied with this training video, I will refund your money.